I seem to have developed a taste for ghost-hunting stories of late, including treasures such as Jonathon Stroud’s rip-roaring Lockwood & Co series, and the dazzlingly and original Skinful of Shadows by Frances Hardinge. A Properly Unhaunted Place is another good 'un. It provides an unusual take on traditional ghost stories in which the living seek to send ghostly beings firmly on to the lands of the dead. In this middle grade novel, William Alexander skillfully introduces us to the unsettling town of Ingot. The protagonist, Rosa Diaz, has just moved in with her mother and is not happy about her new home. Something is not right here.Something is missing. Something important. Although, as yet, we do not know what. The story unfolds on two levels. We learn that Ingot is strange because it is unhaunted: the ghosts that ordinarily exist alongside the living are notably absent. So why would Rosa’s mother, an appeasement specialist, bring her daughter, who is also skilled in these arts, here? Appeasement specialists respect the dead. They negotiate with restless or troublesome ghosts and strike deals with them so that they settle. And why is Ingot ghostless in any event? Rosa befriends Jasper, a local boy, whose parents are heavily involved in the renowned Renaissance Festival that reenacts historical events on a grand scale all summer long. As Jasper introduces Rosa to the festival, the unthinkable happens -- a ghost bursts out of the forest towards the living. Kelly Murphy's illustrations are scattered sparsely throughout the text. My favourites include her depictions of the otherworldly creatures, and also the image of Jasper with his armour-clad father, cleverly reflecting the face of Rosa in the chest-plate. 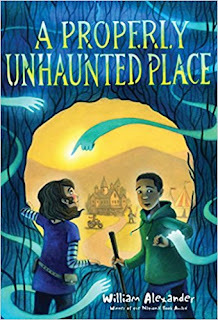 Rosa confronts the questions raised by the unexpected ghost and, together with Jasper, begins to investigate its origins and ultimately Ingot’s past that seems lost beyond the townspeople’s collective memory. Ultimately the past and the present must make peace with each other and learn to coexist. It is healthy to remember our ghosts and welcome them in. This sounds a fascinating title, Sarah. Thanks for sharing it on Awfully Big Reviews. 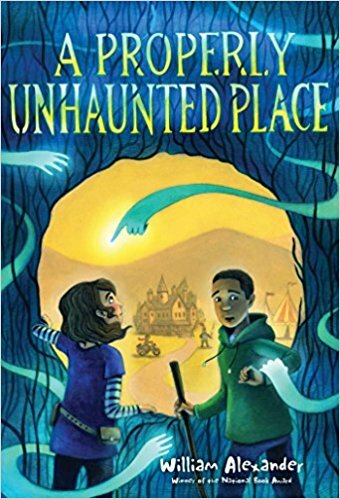 Middle Grade novels are tricky to get just right but this ghostly tale sounds enticing. Welcome to the Awfully Big Blog Adventure Review section. Here you'll find members of the Scattered Authors Society offering their thoughts and enthusiasms on a wide variety of books for all kinds of readers. We read all ages of childrens books, young adult books, as well as novels for adults and.books about writing an dthe creative processes. We only review books that we genuinely feel we can recommend. You'll find books that have mattered to us as well as recently published work, forthcoming titles and other ways of sharing words and stories. So do keep visiting the Awfully Big Review pages! Site illustrations by Hannah Shaw www.hannahshawillustrator.co.uk. Powered by Blogger.